Protestors hold a sign as they gather outside where Prime Minster Justin Trudeau speaks at a Liberal donor appreciation event in Toronto on Wednesday, March 27, 2019. Justin Trudeau apologized Thursday after facing widespread condemnation for offhand comments he made to Indigenous-rights activists at a Liberal Party fundraiser the night before. Video of the Prime Minister’s dismissive response to protesters raising concerns about mercury poisoning in a Northwestern Ontario community spread quickly online and provoked strong criticism from Canada’s Indigenous communities and beyond. 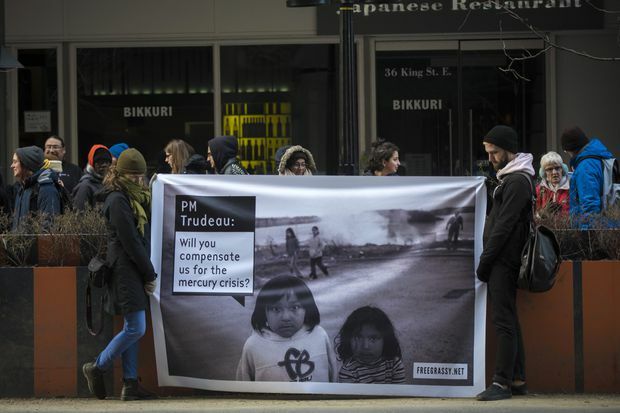 With members of the Grassy Narrows First Nation protesting outside the Toronto fundraiser on Wednesday, two non-members advocating on their behalf attended the event, which required a minimum $1,500 donation to the Liberal Party. They interrupted Mr. Trudeau’s speech to supporters to shout their concerns about Grassy Narrows. “Thank you very much for your donation tonight, I really appreciate the donation to the Liberal Party of Canada,” Mr. Trudeau replied, as audience members cheered while the protesters were escorted from the room. Perry Bellegarde, the National Chief of the Assembly of First Nations, said Mr. Trudeau’s comments “are completely unacceptable and offensive” and called on the Prime Minister to visit Grassy Narrows. Members of the First Nation have endured decades of severe health problems linked to toxins released into the river system in the 1960s by a Dryden, Ont., paper mill. Speaking with reporters Thursday morning in Halifax, Mr. Trudeau apologized for the way he handled the situation. The Prime Minister’s apology comes as his government’s commitment to its reconciliation agenda is being questioned in the wake of the Feb. 12 resignation from cabinet of Jody Wilson-Raybould, a high-profile member of the Kwakwaka’wakw nation in B.C, who said that as attorney-general she faced inappropriate pressure from the Prime Minister’s Office over the criminal prosecution of SNC-Lavalin. Opinion: Four years in, will Trudeau need to prove again he’s up to his job? Jane Philpott resigned from cabinet as Treasury Board President on March 4, saying she had lost confidence in the government’s handling of the SNC-Lavalin issue. She was previously minister of Indigenous services and had met with Grassy Nation staff in December. She had promised the federal government would “do the right thing” in providing health facilities in the community. While Mr. Trudeau initially said Thursday that the protesters may have had a child affected by mercury poisoning, one of them said that only applied to the people who were outside the room and not to the two who confronted the Prime Minister inside. Mark Calzavara, an organizer for the Council of Canadians, an activist group, was one of the two protesters inside the event and he shot a phone video there. He told The Globe and Mail that neither he nor his colleague are from Grassy Narrows, but were protesting on behalf of the community members there. Mr. Bellegarde, the head of the AFN, issued a statement after Mr. Trudeau’s Thursday remarks. “We see the Prime Minister has apologized this morning. He should apologize directly to those involved and he should visit Grassy Narrows and [neighbouring] Wabaseemoong to talk to the people there and see the impacts of the mercury contamination firsthand,” he said in a statement. “This incident highlights the need for action now." The National Chief is among the many Canadians who expressed alarm over Mr. Trudeau’s comments as video of the event was widely shared online. NDP Leader Jagmeet Singh said he has visited the community and met with people who are suffering from the many illnesses associated with mercury poisoning. The Prime Minister also said the Liberal Party will return the donations the protesters made to attend the Wednesday event.